The Vancouver Condo Buzz » From $474,900 > Boutique Vancouver Westside Condos at The Vermeer Kitsilano Now Selling! Only 13 Available! « Boutique Living on the North Shore now available at THE VUE North Vancouver Marine Drive Condos! 4 Storey Low-Rise Building with Great Features! Luxury Vancouver Westside condos are now previewing at The Vermeer Kitsilano! Boasting timeless architecture, contemporary and ultra boutique finishes as well as the kind of lavish touches you would expect from one of Vancouver real estate’s most finest and refined residences, The Vermeer Vancouver Westside condos are now here! 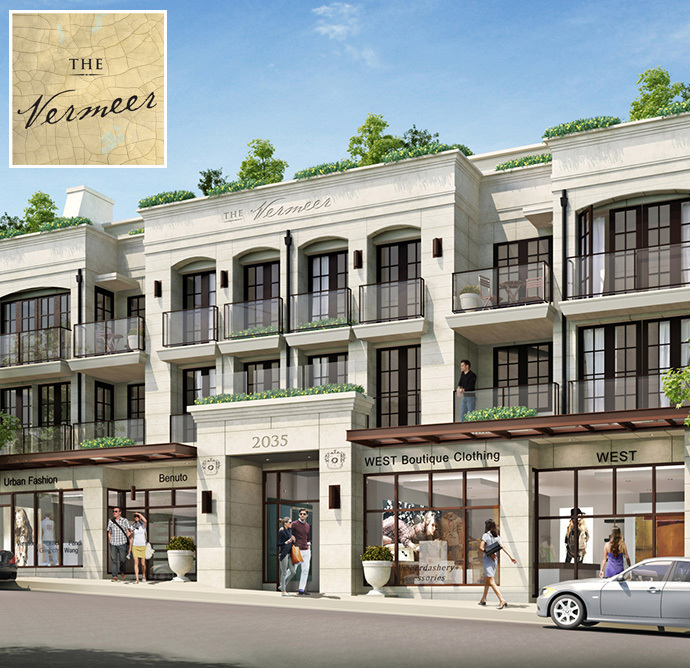 And by September 2013, The Vermeer Vancouver should be ready for move-ins, so there are no pre-construction waits! Featuring only 13 luxury Vancouver residences, The Vermeer is brought to the luxury market by Thomas Properties Developers, Formwerks Architectural & Interior Design, Kindred Construction Ltd. And the following artisans: Tony Rojac Architectural, Stone Masonry, Gilroy Stained Glass Vancouver and Dalbergia Wood + Fine Objects. The prices for the ultra luxury Vancouver residences starts from just $474,900 and are located in the heart of Kitsilano Vancouver Westside. Some of the architectural features of this boutique low-rise building includes solid concrete construction with a timeless limestone exterior façade in addition to home automation system and air conditioning for year round comfort. Also, the luxury Vancouver Westside condos will feature outdoor spaces for all floor plans, views for homes facing north and gourmet kitchens that include everything from Eggersman cabinetry to Miele appliances. Live in Kitsilano, the prime Westside Vancouver neighbourhood which is very close to numerous parks, beaches, False Creek, South Granville, downtown Vancouver, Point Grey and UBC. Also, Vanier Park, the Museum of Vancouver, Maritime Museum, top ranked schools, boutique retailers, Kits Beach Pool and English Bay are within walking distance! For more information, please visit www.thevermeer.ca today and register for your private walk through before completion in September 2013. The boutique low-rise building will feature both one and two bedroom floor plans between the sizes of 699 to 1,685 square feet. The solid concrete construction with limestone façade is truly unique and elegant and there are Euro style windows and elegant solid wood casings throughout the building. As well, The Vermeer Vancouver Westside condos will feature contemporary interior colour palettes with custom milled, solid wood entry doors (beautiful!) as well as engineered hardwood floors in charcoal finish, sleek roller window shades and recessed pot lights. The homes are protected by Provident Security system and there is secured underground parking with storage and bike rooms on site. The next generation technology at the luxury Vancouver Vermeer condos include full smart wired homes with integrated climate control and 5.1 surround sound as an optional upgrade that can be controlled by Android or iOS. As well, there is a fully customizable automation system for additional lighting control, music control and more. The keyless enterphone system is also another great feature and there is lighting control via your devices. 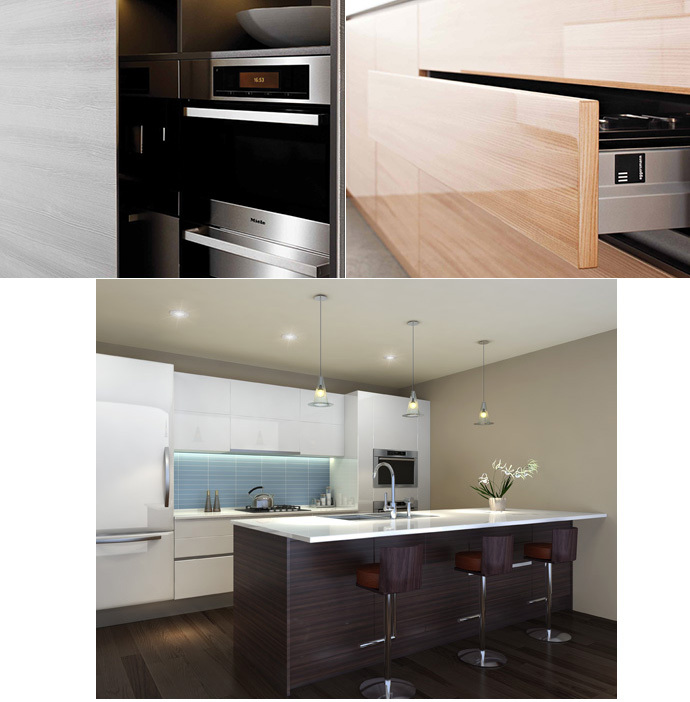 In addition, The Vermeer Vancouver luxury Westside condos will feature sophisticated kitchens with a premium Miele appliance set that includes a fridge/freezer, speed oven, wall oven, four burner gas cooktop, built in hood fan, integrated dishwasher and under counter wine cooler. The kitchens also feature recessed under cabinet task lights, European designed, blown glass kitchen island pendants and polished glass tiled backsplash. The luxury Vancouver Vermeer apartments in Kitsilano will also feature professional grade Grohe dual spray pull down faucet, quartz counters with Kubus 18 gauge double undermount sink and Eggersman high gloss, soft close cabinets with textured laminate islands by Inform Interiors. The spa inspired ensuite bathrooms at The Vermeer Kitsilano luxury apartments include hand laid oversized stone tiled floors with NuHeat radiant radiant heating mats as well as polished marble counters with under mounted sinks. Other ensuite features include contemporary Grohe polished chrome accessories, Toto dual flush toilet with soft close seats, stylish Eggersman textured laminate cabinets by Inform Interiors and polished tiled shower/tub surround with mosaic accents. The second bathrooms at The Vermeer Vancouver condos are also beautiful with hand laid oversized stone tile and NuHeat radiant heating mats as well as white alcove bathtub with tiled apron and large format tub surround with vertical accents. Other great features include Grohe accessories, Toto dual flush toilets and Inform Interiors selected Eggersman cabinetry. The penthouse floor at this boutique Kitsilano Vancouver luxury development features over height ceilings at 10 feet with tilt/turn glass doors that glide open to spacious decks. Also, there are Marquis gas fireplace inserts on the roof decks in addition to widescreen interior fireplace with ceramic glass front. The roller blinds are there for added privacy and are also remote controlled. The master ensuites at The Vermeer Penthouses include luxurious showers featuring Dornbracht polished chrome ceiling mounted rain head and wall mounted hand shower with slide bar in addition to an elegant Dornbracht polished chrome accessory set and Bain Ultra wellness drop in jet air tub with a heated backrest! The kitchens at the Vancouver Vermeer Penthouse suites includes top of the line Miele appliances (MasterChef series) with a wine cooler and built in coffee system. There are integrated panel designer dishwasher and Dornbracht single lever mixer with rinsing spray faucet. The second bathrooms will also have Dornbracht finishes and the Bain Ultra Wellness drop in jet air tub.